We’ve got you covered if you’re shopping for the best pet seat covers for you and your dog. When you have pets, like your beloved canines travelling with you in the car, you’re bringing more than just them along for a ride. You’re also bringing their hair, slobber, toys, bones, some dirt, mud, and maybe a bit of ocean water to top it all off. That’s just a part of the doggy deal. We know how things roll for dogs. ShearComfort Seat Covers are there to make things a bit easier, and honestly cleaner, for you while driving with your dogs. We also know that not all automotive accessories are geared towards doggy use, so we thought we’d feature the best dog seat covers for you and your four legged friend. When we say our CORDURA® Seat Covers are extremely tough and rugged and one of the best dog seat covers out there, we’re not yanking your chain. In fact, you can tug, pull, and yank on this material without worrying about tearing or fraying.The high-wearing material is the authentic trademarked, CORDURA® brand fabric. Taking this waterproof and abrasion-resistant material and producing custom seat covers out of it ensures that you’re getting the maximum protection for your car or truck. This is the protection you need when travelling with your dog. Just because CORDURA® seat covers are tough, doesn’t mean you can’t have a bit of fun with them. These custom seat covers come in 5 colors. You can choose a solid one-color look selecting solid Black, Gray, Tan, Blue or Burgundy. Or go even more custom with a two tone look pairing any of the colors with one another. This gives you the freedom to design your seat covers just the way you want. 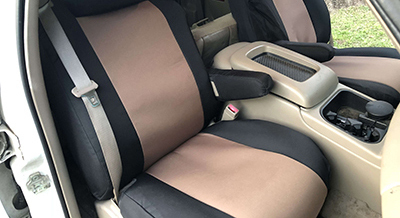 Now that you know about CORDURA® and how you can customize your seat covers, let’s talk about what type of dog this type of material is geared for. If you’ve got a big guy like a Labrador or German Shepherd that sometimes don’t know their own weight or size, these are some of the best pet seat covers for SUVs, trucks, or cars. When they hop into the vehicle, they won’t be able to tear through the material causing damage to your existing upholstery. For the little guys that can no more destroy car upholstery than they can jump into your vehicle, you may want to avoid going for the heavy-duty materials and opt for our Neo-Supreme or Velour Seat Covers. However, we highly recommend talking to a sales representative if you’re ever in doubt of what to order for you and your dog. As with most things in life, there isn’t just one option for high-wearing, waterproof canvas-like seat covers best fit for dog-use. Another paw-tastic automotive accessory for dogs is our Atomic Pro-Tect Seat Covers. Similar to CORDURA®, but these seat covers are polyester with polyurethane waterproof coated material. This means your interior you’ll be safe with these highly protective seat covers on your seats as your pet joins you for a long road trip or a quick drive to the beach (you’ll really want them after they go for a swim!). Customization is still possible with our Atomic Pro-Tect Seat Cover line. You can select from Black, Gray or Tan. Of course, there's always adding a bit of a sportier by going with our two tone. These colors complement many different interiors. Not to mention you can customize and choose a color that will hide your dog's fur or hair! Always something to keep in mind. With the highly protective, waterproof material paired with your ability to customize to your dog this means any size dog can join you for a ride. Whether it is your lovable lab that hops in, your clumsy puppy tries to jump (and fails) or French bulldog plops itself heavily onto your seat. Consider opting for the Premium Set Package (for any material you might be looking at). The reason for this is because a lot of the damage doesn’t just happen to the seats when you have a dog. Their drool and hair can make its way onto your headrests and armrests. Not to mention if you have a puppy these sorts of things can be the perfect thing to chew on while teething. If you live by the motto, “Keep it simple”, then our Pro-Tect Vinyl Seat Covers are right up your alley. They will not only provide you with maximum protection from your dog hair, claws/paws, slobber, and all else. They will also provide a clean and simple look to your car or truck. The number one priority for these pet seat covers is to protect and since they’re made of extremely, high-wearing automotive grade Vinyl, they do just that! It would be near impossible for a dog to chew or tear these are some of the best back seat dog covers as the rear seat is likely where you dog spends most of his time in the car. 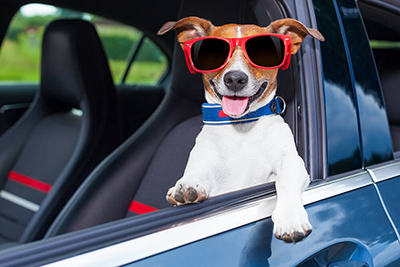 We kept things simple for you with these dog car accessories. We offer three colors to suit your needs: Black, Gray or Tan. They can be ordering in solid colors only, just to make things super easy for you. That being said, you can opt for a color that both suits with your vehicle’s interior and is similar to your dog’s hair. Having a fully protected seat with our Pro-Tect Vinyl can stop damage from all dog sizes. It can be nice for dogs who love to go swimming, roll in the mud or tend to bring half the forest home with them as Pro-Tect Vinyl is extremely easy to wipe down and clean. All of the materials we’ve mentioned are the best car seat covers for dog hair. Whether it is the tightly woven CORDURA® and Atomic Pro-Tect or the smooth yet durable Pro-Tect Vinyl, you will easily be able to vacuum to get rid of all types of dog hair or fur. Dog hair will not weave into any of these three materials. Your dog is going to get dirty. Your dog is going to get muddy. Your dog is going to get wet. Rather than stressing about your vehicle when you’re headed out with your dog for a hike, beach day or anywhere else, these are the best dog seat covers to protect your car’s interior. Let dogs be dogs, right?